Van rentals, convertibles, luxury cars, SUVs and sports cars are some of the most popular & highly rented categories at the Tampa International Airport. Rent a car for Tampa International Airport in just three quick steps - search, compare, reserve! Cancel your Tampa International Airport car rental for free, up to 48 hours before the pickup time. Car rental at Tampa International Airport (TPA) lets you drive to the city, located at 10 km from the airport, on your own. Tampa International Airport, known as Drew Field Municipal Airport until 1952, is one of the busiest airports in Florida. Powered by top suppliers, we give you easy online booking of economical Tampa International Airport car rental deal. Our friendly association with top suppliers allows us to give you all inclusive Tampa international Airport car rental deal with collision damage waiver, airport fee, local VAT tax, liability insurance and more. Widely popular for using “people movers” to connect Landside to Airside, Tampa International Airport is a center for both commercial as well as leisure travel. Around 25 major airlines operate out of Tampa International Airport with non-stop flight services to 71 destinations and around 20 million passengers pass through Tampa International Airport every year. Publicly owned by the Hillsborough County Aviation Authority, it is Tampa`s main airport and serves the Tampa Bay Area to a large extent. To get there or to get to the city from Tampa International Airport, you can use the Tampa Airport car hire desks. Tampa International Airport is host to Bombardier Transportation’s APM system and was the first to install the “People Mover” system which is driver-less and full automated. Tampa International Airport offers a variety of services like Helpdesks, Lost and Found, wheelchair assistance and relief areas for your pets. There are also several eateries as well as beverage points where you can grab a bite as well as outdoor smoking areas. They also offer good parking services, if you are driving there yourself. There are business facilities and internet access at the airport. The Columbia Restaurant -This is a Spanish restaurant established since the year 1905, a very popular landmark in Tampa. Bern’s Steak house – One of the best steak houses in Tampa, it is also popular for its widest list of wines anywhere in the world. The View at CK’s – An elegant revolving gourmet eating place right at the top of the Marriott in the middle of Tampa International Airport. Tampa Bay Brewing Company – Famous brewery in Tampa also serving a decent food menu, along with affordable fares. 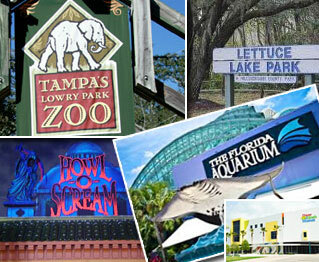 A large- scale aquarium accredited by the Association of Zoos and Aquariums. The number 1 Family Friendly Zoo. This museum is famous for providing learning through interactive plays. This Park features numerous boardwalks, barbeque pits etc.